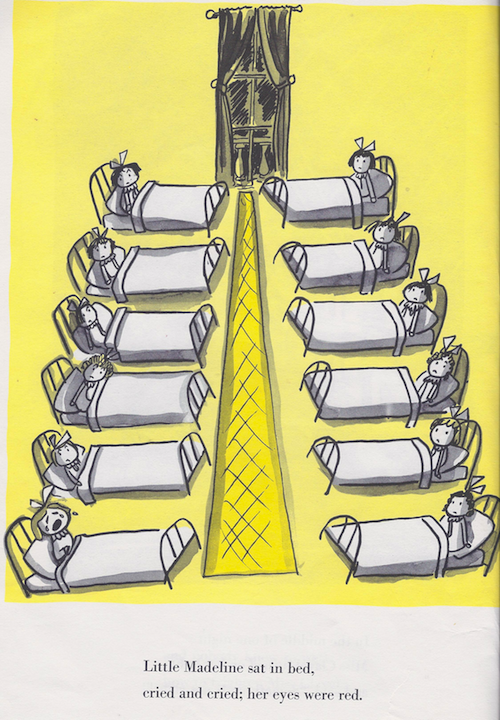 Mystery in a children’s classic: Who is the 12th girl at dinner while Madeline is in the hospital? 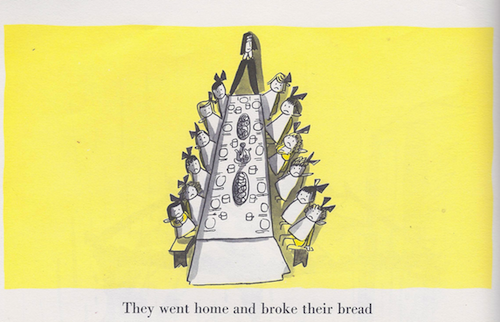 Nearly everyone is familiar with Madeline, Ludwig Bemelmans’ classic 1939 children’s tale of the girls in a Parisian boarding school. You will recall that there are 12 of them, and they go about their days in two nice little lines. Always 12 of them, whether they are out and about. Or eating, washing up or sleeping. But then one night, poor little Madeline gets sick :-(. She has appendicitis, and needs surgery. She has to spend a few weeks recovering in the hospital. So now there are only 11 girls. But in the midst of the lonely days spent pining for Madeline’s return, they have dinner. The girls are sad. All 12 of them. It’s back to eleven when they brush their teeth and go to bed. What’s going on? I’ve studied the faces of the 11 remaining girls, and while the images are not entirely consistent, this girl never appears anywhere else. Who is the mystery girl? Where did she come from? And why didn’t she brush her teeth after eating? But seriously. I find this kind of thing curious. 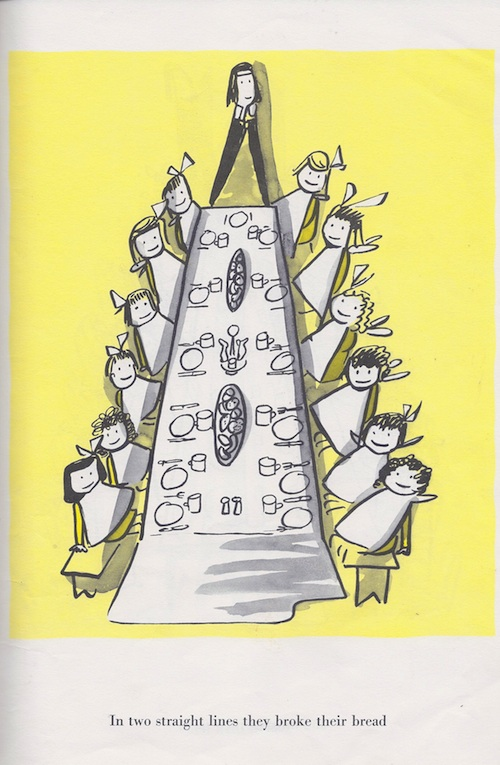 Bemelmans was clearly pretty careful about counting the number of girls in each scene. So how did this one get screwed up? And why didn’t anyone notice before it was published. Or since (as far as I can tell from searching the web, this has not been noted before). HA!! Interesting post, mike; this classic is new to me and I may be one of the few people that have never heard of this. The way you hid the eyes of the mystery girl is hilarious!! Rupinder, I think the mysterious girl is the one next to (up) the girl with the hidden eyes. well this is interesting. you have a very keen eyes. Mike, I thought Marina and I were the only persons in the world to have noticed this! It’s always bothered us. I imagine the error occurred because the artist had drawn a number of pictures of the girls eating at the table, and the layout artist selected the wrong picture when compiling the book. Rebecca Kennison once told me about publishing that nothing published is ever perfect. A likely answer to this riddle was published by Douglas Hofstadter in 1980. As Achilles explains to Mr Tortoise, M. C. Escher’s lithographs are all connected behind the frames (thus enabling the pair to make some startling escapes in the course of their fantastic adventures). I’m certain that this is true, and believe that the principle may apply to text and image of all kinds. 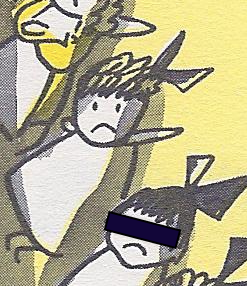 The twelfth little girl simply wandered in from another story for the duration of one page. 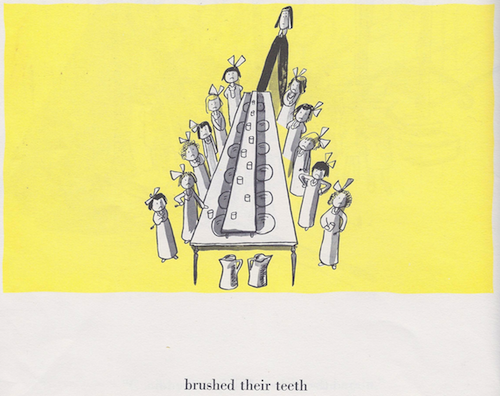 There’s no need to assume she doesn’t brush her teeth after eating – most likely she does so on the next page – in her reference frame – which for us seems to be in a different book. Perhaps someone knows where she turns up again? I just did a Google search to research this very thing. I’m so perplexed as to how this happened! (And why you’re the only one on the internet to mention it!) Thanks for not making me feel crazy! 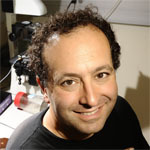 Thank you for your important work! I noticed this too on about my 5th read of the book and was totally baffled as well. I too have been scouring the Internet but have not found an answer yet. I wondered if I was the only person who actually counted the girls in the pictures. 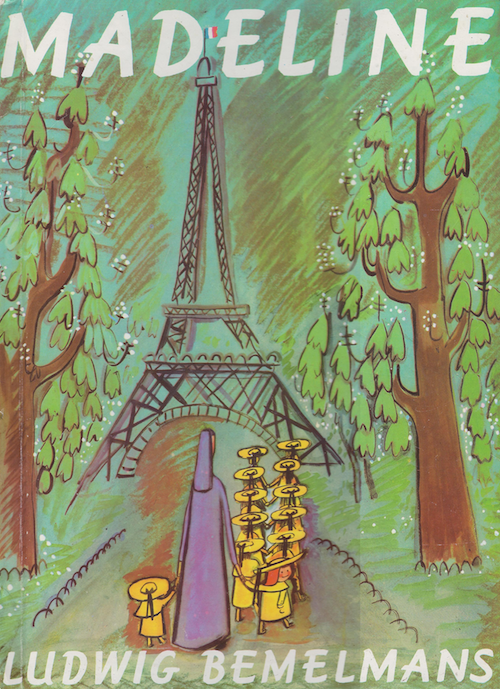 I suspect M Bemelman sketched in the girls faces and hair w/o much thought to how they looked, except for Madeline. There doesn’t seem to be much consistency from one illustration to the next. Such pedantic nitpicking. But I repeat myself. 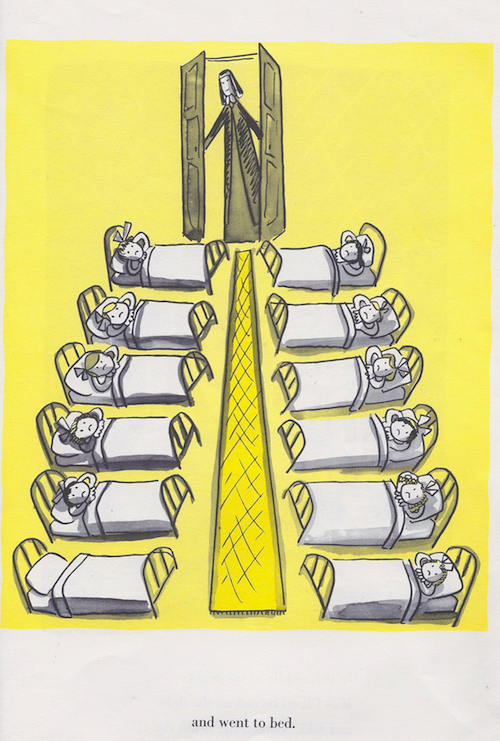 Maybe someone could check this too – I think there is a problem with the sleeping arrangement when Madeline is in hospital. 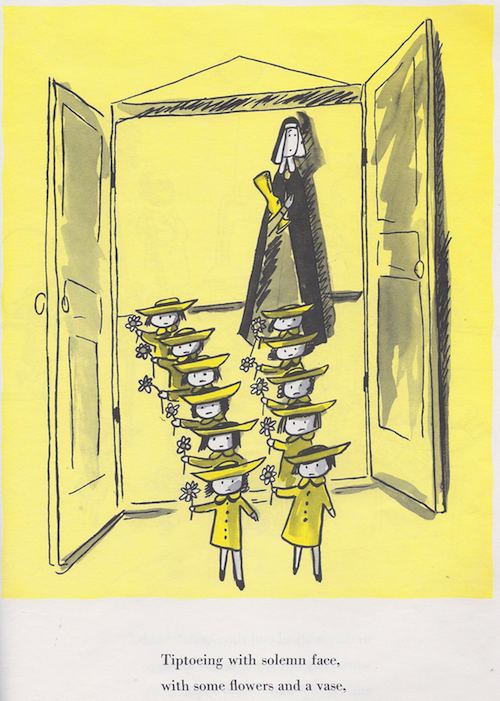 On one page the empty bed is by the window, but on the next it is by the door that Miss Clavel comes in……. I’ve done a Google search, but no-one seems to have noticed this. So glad to find this! 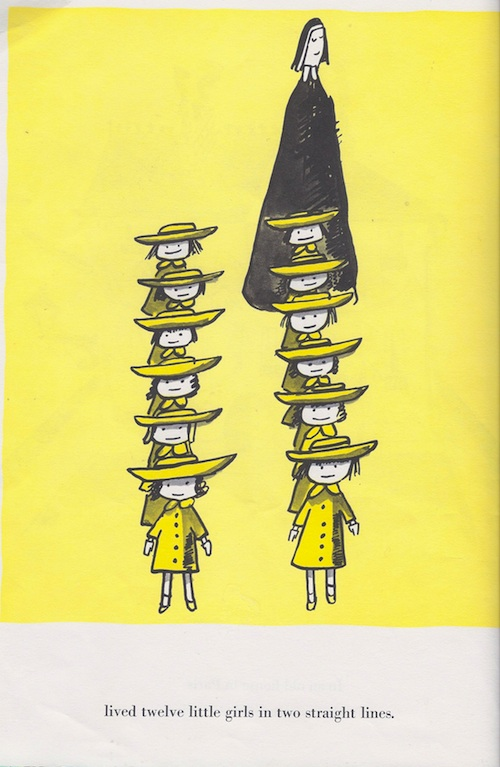 My daughter and I made the discovery of the mysterious 12th girl tonight and were very puzzled. Happy to know we weren’t just imagining her.